Science rocks with Flumpa's World: Water, Water Everywhere featuring Wendy Whitten 'The Singing Scientist' and Rick Florian, the third release in the multi-award winning science musical audio series, Flumpa's World. Flumpa's World: Water, Water, Everywhere is the result of a continued collaboration between Wendy Whitten and Rick Florian. Their desire to bring the world of science to life through solid, entertaining music for children ages 3-9 stems from their own love of science, music and performance. Wendy 'The Singing Scientist', Bachelor of Science - Agriculture and Life Sciences from the University of Maryland, is an award wining author, singer, songwriter and Flumpa creator. Rick Florian, B.S.S.Ed. - Biology and Secondary Education, is a songwriter and singer and father of four! Flumpa, the adventurous, blue-eyed tree frog, is making a SPLASH! With the release of a new CD, Flumpa's World: Water, Water Everywhere, Ion Imagination Entertainment Inc. of Nashville, Tenn., presents "everyone's favorite amphibian," his creator, Wendy Whitten - 'The Singing Scientist,' and 14 original, fun- and fact-filled songs ranging from rock to pop, hip-hop and even island rhythms. "With this CD we're opening kids minds and hearts to the fascinating world of water - from the elements that combine to make water to the amazing and diverse water habitats," says the energetic Wendy. Flumpa's World: Water, Water Everywhere features musical efforts that include the rousing opening song, Flumpa's Splash Zone, the CD title song, Water, Water Everywhere, the adventurous Horizons Unknown and Seven Seas, sea mammal-friendly Friends of the Seas, songs that explore watery habitats and scientific properties, Wetlands, Edge of the Sea, Under the Waves and Water Cycle, and the full-of-wonder finale Amazing World. Songs from Flumpa's World: Water, Water Everywhere already have been featured in - and received enthusiastic reactions from fans attending - performances of Flumpa and Friends LIVE! touring show, "getting kids worked up over science in its most fluid form," according to a recent story in one Texas newspaper. The new set adds to a growing catalogue of award-winning, music-and-science CDs which includes the first two Flumpa's World recordings, Frogs, Rain Forests & Other Fun Facts and Out of This World. As with previous Flumpa's World CDs, the music and lyrics for all new songs were written and performed by Wendy Whitten, B.S. Agriculture and Life Sciences from the University of Maryland, with a voice Family Fun magazine called "clear as a mountain stream," and Rick Florian, B.S.S.Ed. Biology and Secondary Education from Taylor University, former lead singer for the music group White Heart. Both bring to the creative partnership enviable records of entertainment success, a love of science, and a dedication to educating youngsters by making learning fun. "We want to make sense out of science for inquisitive young minds," explains Wendy. "So, using a character such as Flumpa - and songs that motivate - enables children to grasp science concepts in a fun and entertaining way." 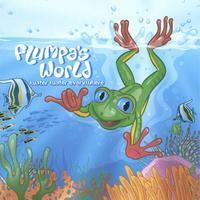 Previous Flumpa products, The Adventures of Flumpa and Friends, Someday ... Someday book and cassette, and the two Flumpa's World CDs, have garnered national acclaim with awards from Parents' Choice Foundation, the Parent's Guide, Dr. Toy's 100 Best Children's Products, the National Parenting Center, Parent Council and others. Wendy formed Ion Imagination Entertainment in 1994 with the mission of providing families, children and educators with positive, high-energy, educational programs and products featuring Flumpa the tree frog. 1 CD. 35:50 min. Ion Imagination Entertainment. 2004. $14.